Product Name: Multifunctional Cane Chair. Rod body: aluminum alloy surface oxidation. Stool panel: PP Environmental protection material. Height adjustment features: Sitting plate up and down can be 5 gears can be adjusted. Rubber sleeve: environmental protection rubber. Stretch range of crutches: 27-34in. The legs are not healthy. 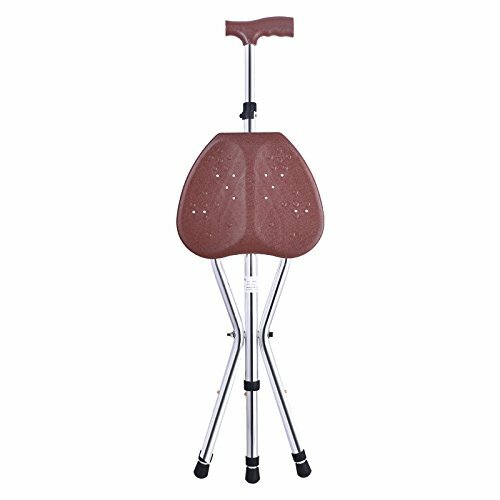 Cane Seat 221 lbs Capacity,Weight: 1.98lbs,Adjusting height range: Sitting Board Height: 17-22in Approximately; Fold Cane Seat Height: 27-34in Approximately. Great for trade fair shows, waiting in lines, traveling, or resting after going for a walk or shopping.The best gift both for elders or yourself. If you have any questions about this product by M-GYG, contact us by completing and submitting the form below. If you are looking for a specif part number, please include it with your message.